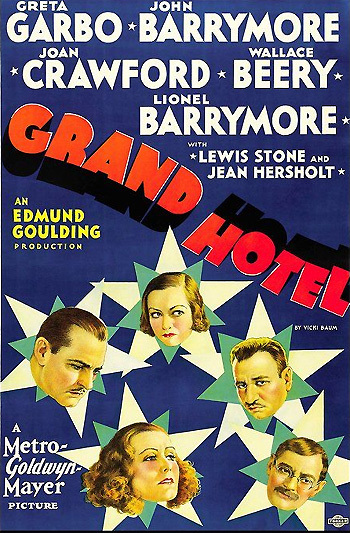 Grand Hotel (1932) remains a classic masterpiece as the first all-star Hollywood epic with many high-powered stars of the early 1930s. The classic MGM film - a pet project of MGM's production head Irving Thalberg ("Boy Wonder") was directed by Edmund Goulding who had acquired the nickname "Lion Tamer" for his ability to deal with many temperamental Hollywood stars, as he did in this film. After MGM acquired stage and film rights to Baum's book (for $35,000), a Broadway stage-play version was first planned as a test of its popularity. It opened in New York City in mid-November, 1930 and became a major hit (and played for over a year with 459 performances). Afterwards, the film was developed as a major MGM project, and given a spectacular premiere at Grauman's Chinese Theatre in Hollywood, with top-priced seats at $1.50! The episodic film (at 112 minutes in length) of a bygone era was set at Berlin's ritzy, opulent art-deco Grand Hotel, and told the multiple-narrative story of the criss-crossing of the lives of five major guests whose fates intertwined for a two-day period at the hotel. Its ensemble cast of stars were occupants of a between-wars German hotel, all struggling with either their finances, scandals, health, emotional loneliness, or social standing in multiple storylines. The film clearly resonated with Depression-Era audiences, who were also financially desperate, in the midst of strivings and worries about their futures, but intrigued and entertained by famous celebrity faces in an appealing melodramatic soap-opera. Extravagant art direction was provided by MGM's famed art designer Cedric Gibbons. Basically, the entire cast was from MGM's star-making 'film factory' to give prestige to the production. The revolutionary film marked the first major use of a large all-star cast ("the greatest cast ever assembled"). [Note: It was the only film that brought together Swedish star Greta Garbo (in one of her earliest sound films) and John Barrymore, nicknamed "The Great Profile."] This pattern (known as the "Grand Hotel format") would later be copied in other big-budget studio productions, including MGM's own Dinner at Eight (1933) - the first all-star comedy, Warner Bros.' Wonder Bar (1934) (set not in a hotel but a Parisian nightclub), Airport (1970), The Poseidon Adventure (1972), and The Towering Inferno (1974), among others. It won the Best Picture Oscar in the year of its release - its only nomination. Only two other times has the film named Best Picture failed to win any other awards: Broadway Melody (1928/9) and Mutiny On the Bounty (1935). It remains - to date - the only film to win Best Picture without having any other nominations. With Wings (1927/28) and Driving Miss Daisy (1989), it was also among a group of Best Picture winners whose director wasn't also nominated. More recently, Wes Anderson's The Grand Budapest Hotel (2014) also made a grand hotel setting (in the fictional European principality of Zubrowka) a character in itself. Senf (Jean Hersholt), an emigre and the head porter at the Grand Hotel, nervously called a Berlin hospital inquiring about news of his wife's imminent delivery of a baby, with the film's first major lines of dialogue: "Hello, hello, hello. Is that the clinic? This is Senf, the Head Porter, Grand Hotel. How's my wife? Is she in pain? Isn't the child coming soon? Patience? Would you have patience?" Grand Hotel. People coming, going. Nothing ever happens. He always seems to be waiting for something, but it never happens. Every day is precious. Every hour, every minute is precious. I came to live here for two weeks, maybe three. Heaven only knows. I can pay whatever you want. I'm tired and ill. Now, I can't wait. Dissatisfied with his originally "cheap" hotel room (#559), Kringelein requested a room upgrade: "I came here from a great distance to live at the Grand Hotel. I want a room, a big room. The same kind of a room you'd give General Director Preysing." He detested his current room: "a little room where the water pipes go 'pop, bing, boom' all day." He was offered one of the hotel's most expensive rooms (#176), one of the front rooms with "a private bar." Later, he vowed to the Baron that he had enough money to pay for his burial costs and to live out his final few days: "I'm going to have a good time while I can." The Baron heartily agreed: "That's my creed, Kringelein: A short life and a gay one," and he promised to be Kringelein's friend. The Baron: You know, I've often wondered what would happen to that old porter if somebody jumped on him from here. Flaemmchen: I'm sure I don't know. Why don't you try it and find out? I don't suppose you'd, uh, take some dictation from me sometime, would you? When she gave no answer except a glaring glance, then he changed courting tactics: "Well, how about some tea, then? ", but she declined. She revealed that she only had one meal a day because she was struggling to make ends meet: "Did you ever see a stenographer with a decent frock on?...One she'd bought herself?" He proposed seeing her the following day at 5:00 pm "in the funny Yellow Room where they dance." She chuckled ("You're funny") but then accepted his offer of a hotel dance date: "We'll dance." And then the on-the-make, good-time girl overheard Kringelein call him "a Baron" - and her interest in the supposedly-rich Baron was intensely magnified. I've slaved in that man's factory for years and years. I know him through and through.